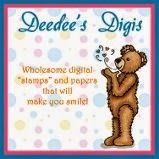 We're still celebrating EARTH Day at Jingle Belles by creating cards featuring recycled elements. Lauren says, "I raided the recycling bag back in December, when a beautiful catalog arrived whose cover had birch trees with fairy lights. There was text at the top and bottom, but I knew that the center section that would be exactly the right size for a tall card and that it wouldn't need much embellishing. 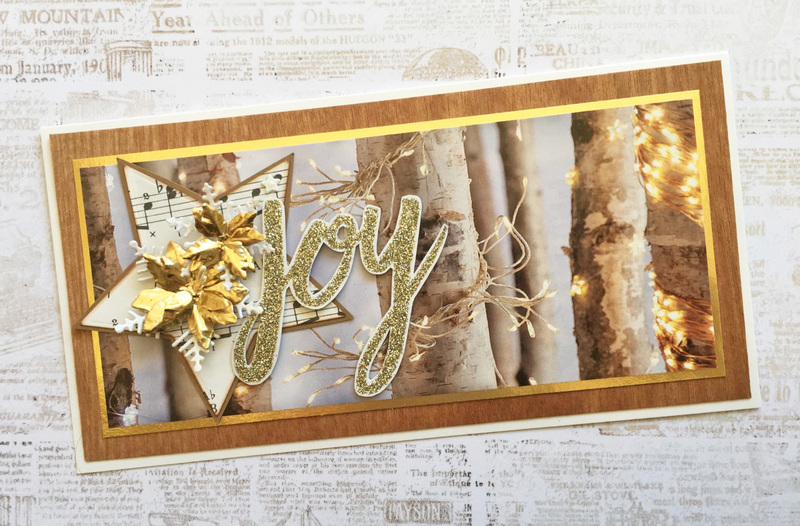 I added a couple of mats (gold metallic and wood veneer seemed like good choices) and rescued a sheet music star from the big box of diecuts. 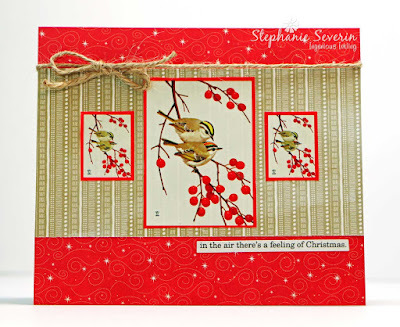 A couple of dimensional poinsettias and a sentiment sticker later and I called it good!" 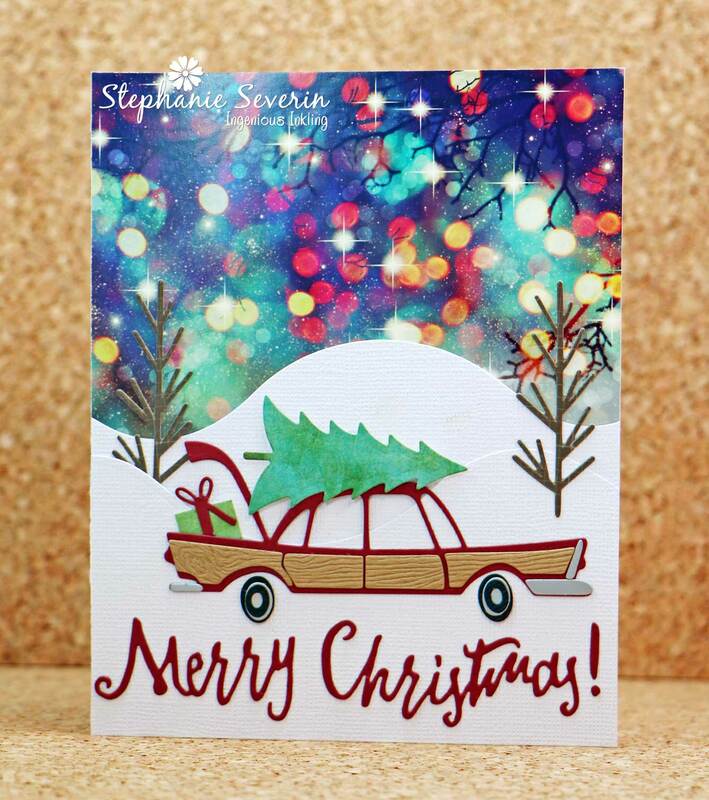 Stephanie says, "My card includes multiple recycled elements ... the bokah sky is from a 2018 holiday card; the trees in the background are cut from Studio Calico packaging; and the silver on the car & wheels was recycled from a specialty paper sample book from the local print shop that our marketing team lets me have every year when the new one comes out. 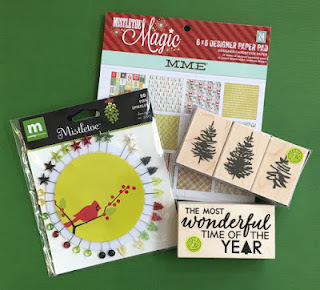 I even pulled the paper for my present and tree out of the trash can by my studio table." Remember, you have until Wednesday at 6pm EST to upload your recycled creations. If you've played along with us in other years, you'll know that we have a few challenges which are the same theme, at the same time, every year. For instance, the first challenge of October is always Pink Xmas. And the fortnight which includes Earth Day is always "RE-use, RE-cycle, UP-cycle". That's just the way it is! Which means... it's time to grab that pretty piece of packaging you saved; or the clear plastic bakery box that could be diecut into shaker card awesomeness; or maybe there's a cereal box in the recycling bin that you could decoupage or paint it to make *free* chipboard embellishments? Don't forget the beautiful store-bought holiday cards we receive each December, or those bits of carefully saved gift wrap... those *totally* count too! Stephanie says, "I save things all year, so I have a selection of elements to choose from for this challenge ... but unfortunately that stash did not survive the recent flooding of our home due to a frozen pipe. 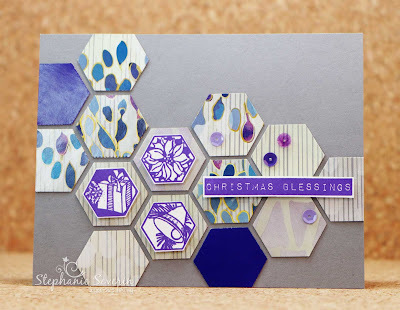 So instead, I pulled a Kleenex Box out of our Recycle Bin, punched a bunch of Hexagons, and made this holiday card with Hexagon Christmas Stamps from STAMPlorations with inspiration from the If You Give a Crafter a Cookie Challenge." Lauren says, "In the spirit of full disclosure I will tell you right off: I used two store-bought cards I received this past December, and they did almost all the work for me!!! 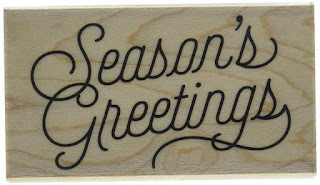 I had planned to add some diecut trees or reindeer or... something... but honestly nothing I tried out really worked. Eventually, I stumbled across the ancient Doodlebug sentiment sticker, which featured exactly the same shade of purple as the sky behind the trees. So I just added a few skinny wisteria cardstock mats, plus some fun Eyelet Outlet Snowflake Brads and called it a day!" Link your eco-centric creations right here by 6pm (EST) on Wednesday, April 24th. Keyword for galleries and Flickr is JB:19:08. 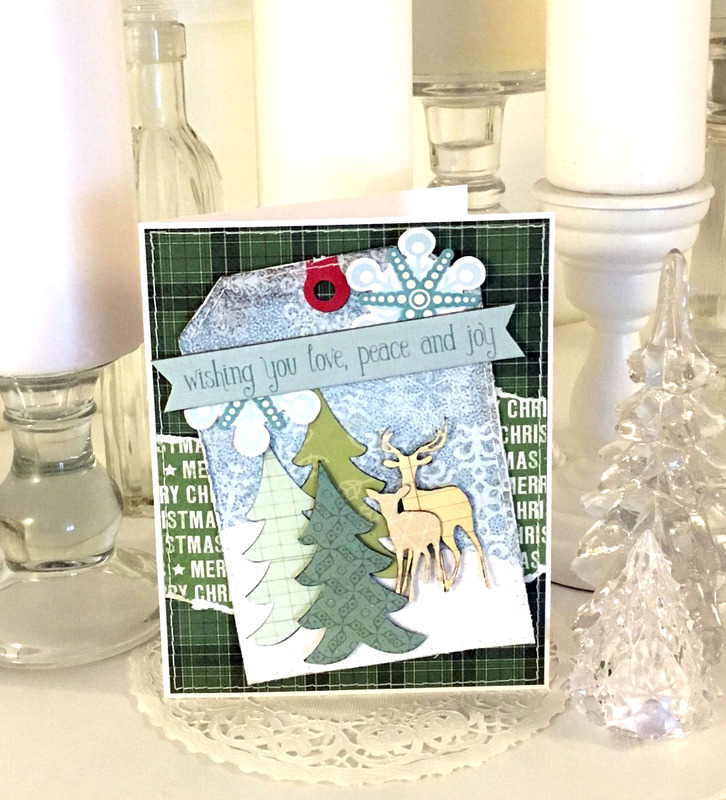 ...fielded a trio of trios: three gorgeous Authentique patterned papers, three stars, three enamel dots... there is not one single thing we don't love about this card! ...went three for three as well! (We love this trend!) 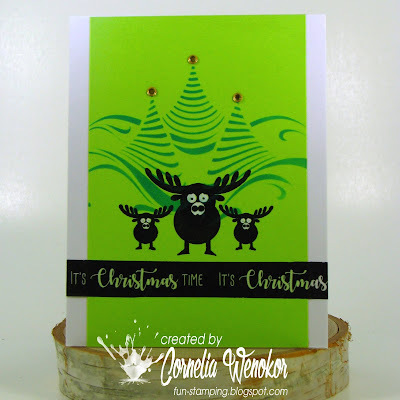 Three happy reindeer, three beautiful funky trees and three jewels on top, all on a gorgeously vibrant neon green background! 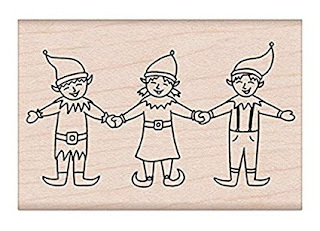 ...has only one trio, but what a fabulous one it is: three of the most handsome snowmen ever, with a bonus in the form of that beautifully watercolored sentiment; so dreamy! We'll be back at midnight with a brand new prompt which we definitely hope you will treasure and not trash! 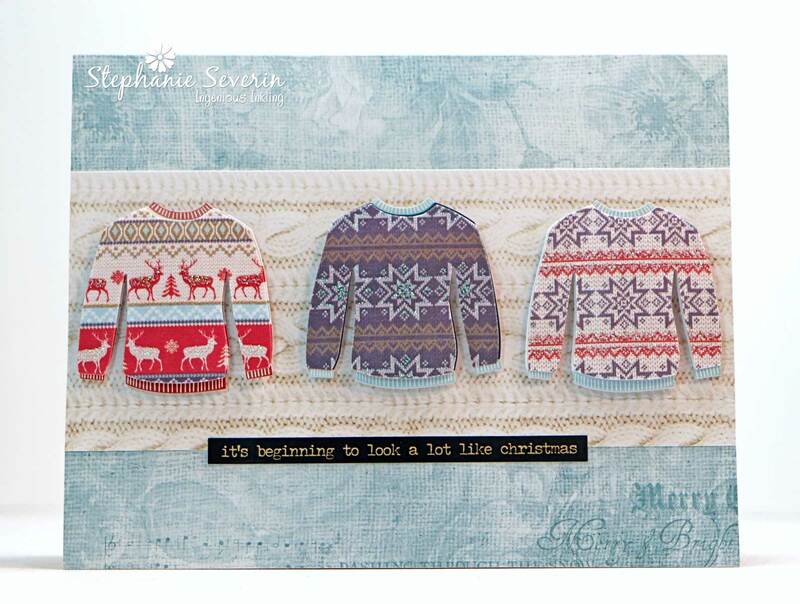 can you ever have too many Christmas Sweaters?" Lauren says, "I had to laugh when I saw the title Stephanie had given this post, because my card has THREE evergreen trees and TWO tiny reindeer, which really IS a 'full house' in poker terms! 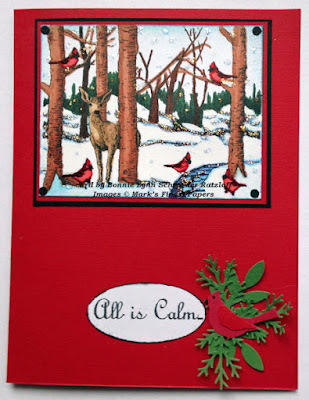 I raided my stash of pre-diecut scraps for all of the above, which made this a very fast and easy card, leaving me extra time to add loads of machine stitching for more texture!" 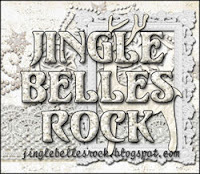 This fortnight's theme at ♥JINGLE BELLES♥ is a tiny bit tricky, so we hope you'll read this entire paragraph! 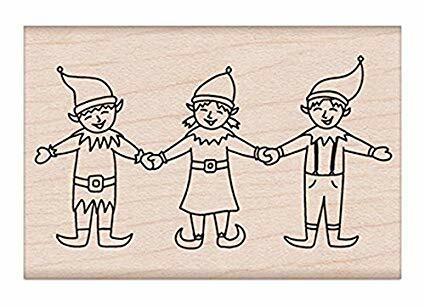 It's called "We Three Kings" but you don't actually need to include any kings in your card's design. We just want to see *THREE* of... well... something! Three reindeer, maybe? Three beautiful dimensional poinsettias? Three yeti would be cool! Or perhaps even three fancy ornaments... the choice is up to you. Lauren says, "One of my favorite uses for leftover ColorBurst (because I *always* mix too much when I watercolor, lol!) is diecutting! In this case, on top of my lovely blendy shades of blue, I've used several different types of modeling paste through various stencils to get the raised designs on my baubles. 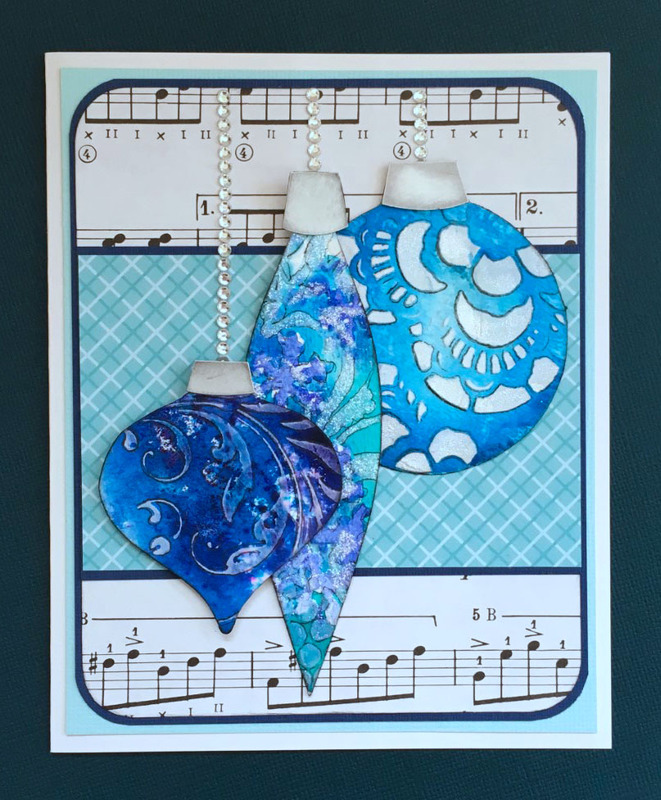 I layered them over sheet music and a coordinating panel of patterned paper, then added Eyelet Outlet Jewel Bling Strips to serve as hangers. Super easy, but satisfyingly creative to make!" Stephanie says, "My card features a vintage (1981 to be exact) trio of Wildlife Greeting Stamps from the National Wildlife Federation. The set had lots of small stamps and then a few larger ones, like the one in the center of my triptych. I finished with a wrap of twine (which reminded me of a bird's nest) and a sticker sentiment"
Link your trio-centric cards here by 6pm (EST) on Wednesday, April 10th. Keyword for galleries and Flickr is JB:19:07. So many cute little birdies in the gallery this week ... here are a few that were particularly tweety. 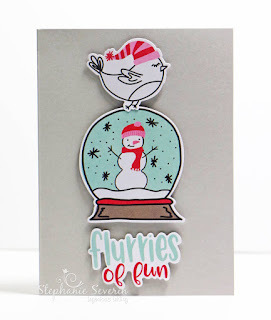 how do you not fall in love with a birdie snowman ... and that perfect snowy sky. 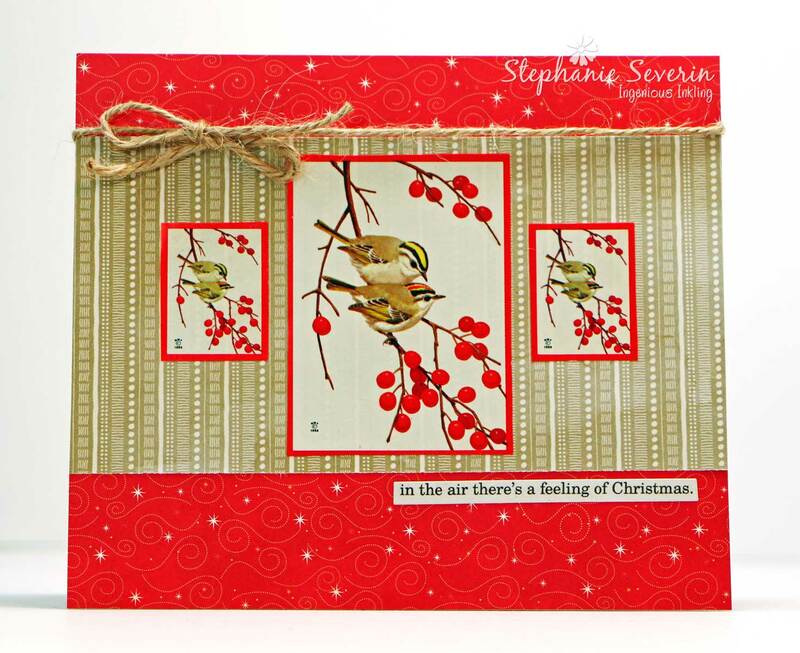 but also added another bird to accent her sentiment. And of course we all want to know who won that fun prize pack, right? According to the fine folks at Random.org, the lucky winner is... #8 which means that Elizabeth... aka... ElizStewart of Paper Sweetness gets the goodies! Please email Lauren at llaurenb @ hotmail.com with your snail mail info, to claim your prize! Make sure you come back at midnight for our next prompt that is *counting* up the ways to celebrate Christmas. We're still rockin' with the robins, prancin' with the penguins and possibly even attending a flamingo fiesta this fortnight... and you still have until Wednesday evening at 6pm EST to link-up and join the fun, which we hope you will (remember there's a prize this week for one lucky participant)! 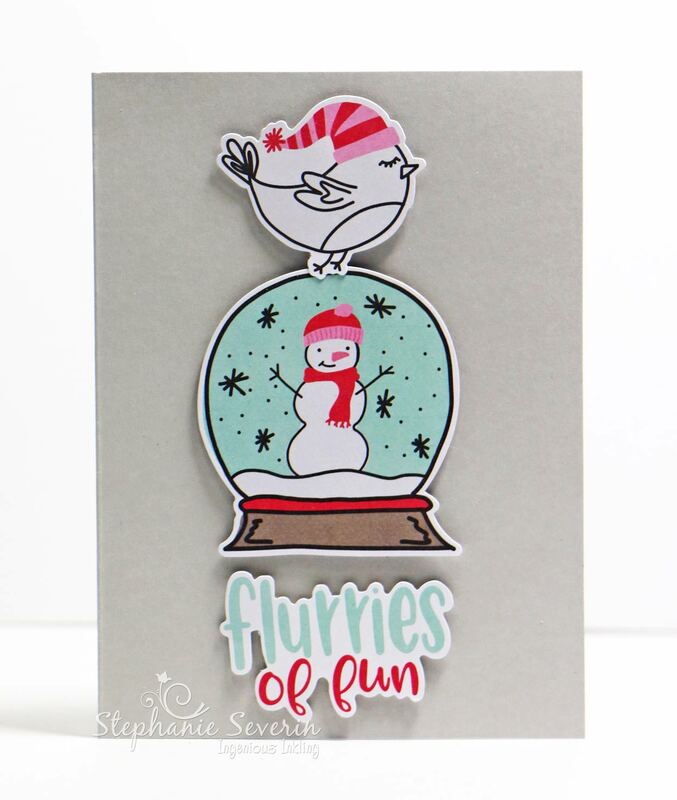 Stephanie says, "This week's card is brought to you by cardstock embellishments on a light grey card base ... doesn't he look perfect perched on the snow globe in his snappy little sock cap ... flurries of fun for sure." Lauren says, "I've gone very distressed and shabby chic this time, with papers from Prima's "Santa Baby" and "Sweet Peppermint" collections, not to mention that lusciously frosted, dimensional poinsettia! 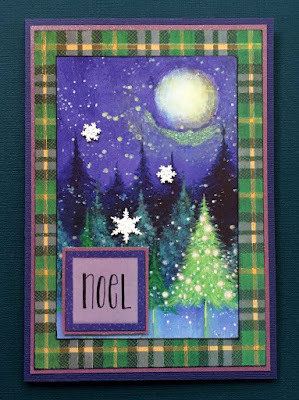 I've added in a washi tape sentiment, a few punched borders and some ancient pinecone stickers that I think look surprisingly good in this context. At the very end, I felt like there was not enough of the darker red from the flower to anchor the design, so I slipped in a burgundy mat before adding lots (and lots!) of machine stitching."